Honey! A delicious, natural food, in its all-natural container. 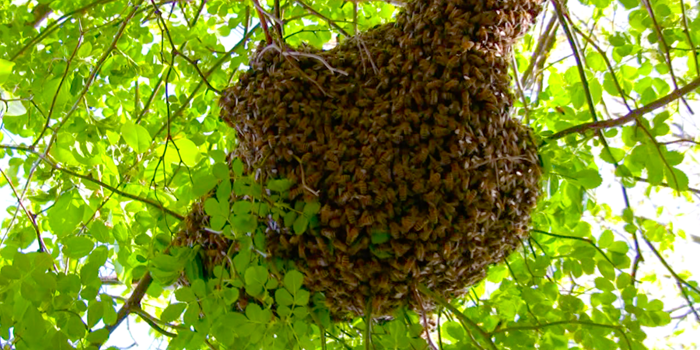 It takes lots of bees to make lots of comb, brood and honey. So many bees so little time! Spectacular Spring color on the forest floor. Lucky bees get to harvest here. Snowdrops are some of the earliest flowers to bloom. They help the bees get a good start. This colony lived in a hollow tree felled by a hurricane. Carl was able to rescue them. 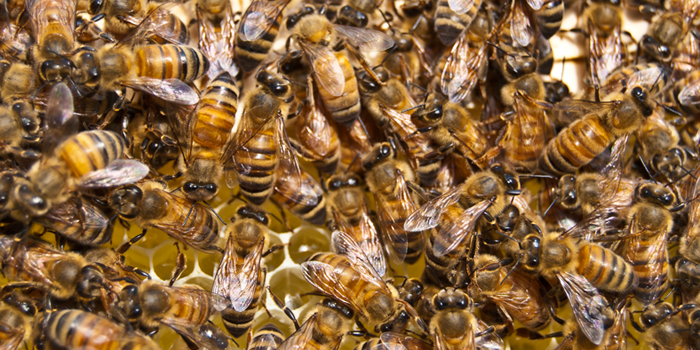 Honeybee colonies reproduce by dividing into two (or more). This group left to find a new home. Honeybees love St. Johnswort flowers. This hedge was alive with foraging bees of several species. 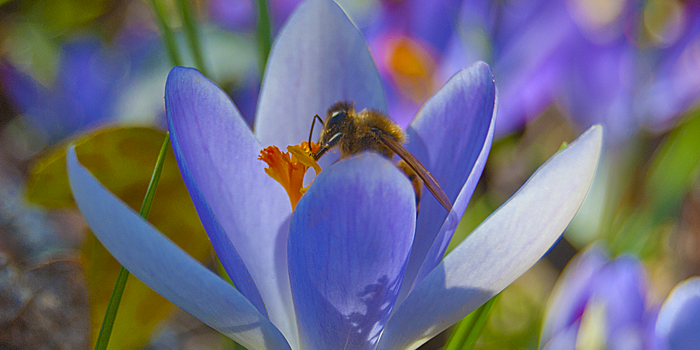 ...another early spring bee-source. 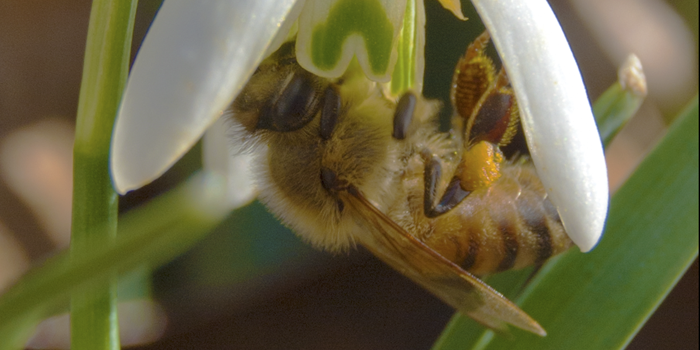 This non-native flower gets many honey bee visits. Flowers only make nectar to attract pollinators, who pay them back by helping distribute pollen so the plants can produce seeds. 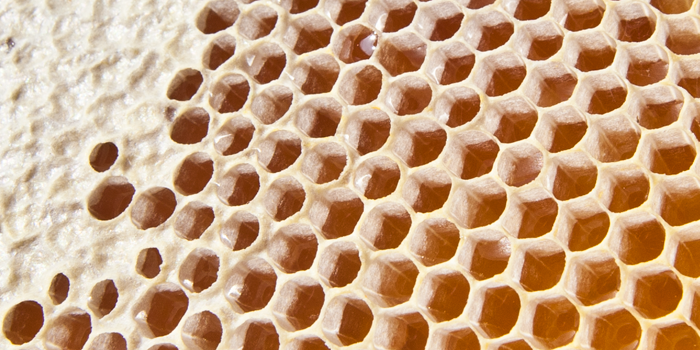 Honey is the substance made when the sweet nectar is gathered, converted and stored by honey bees in their honeycomb. Honey is highly resistant to microbial growth because of its low moisture content, low pH, and other antimicrobial constituents. Uncooked (raw) honey is therefore a wholesome food for humans as long as these conditions are maintained. What is the stuff floating on top of my honey? Honey is dense. Any stuff you may find floating on top of your honey when you open the jar is likely to be beeswax or other things found naturally in the beehive that have floated to the top. Unfiltered honey contain lots of good stuff. Since most of these things are lighter than the honey they will float to the top. Some people prefer their honey still inside the honeycomb, and chew the wax like gum. Carl doesn't currently harvest any honey in cut comb. 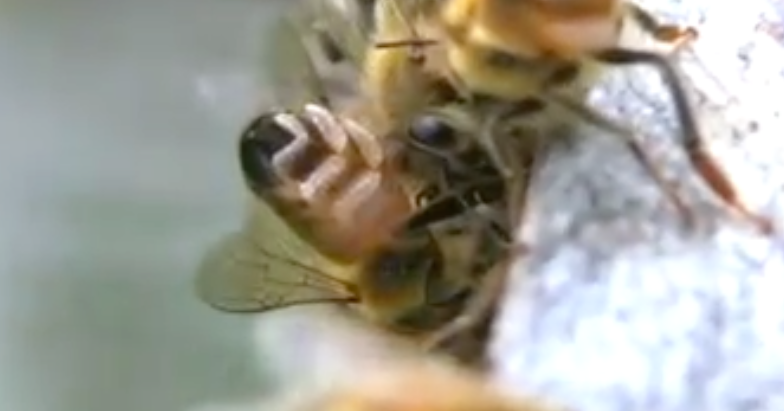 He gives back all the wax comb to the bees for them to re-use, after spinning the honey out. This saves his bees a lot of work and resources. Does it matter how I store my honey? Honey stored in sealed containers can remain stable for decades and even centuries! Glass jars offer the best protection, as plastic is more porous than glass. However, honey is susceptible to physical and chemical changes during storage; it can darken and lose a bit of aroma and flavor. Maintaining constant cool temperatures [below 50°F (10°C)] are ideal for preventing crystallization. Moderate temperatures [50-70°F (10-21°C)] encourage crystallization. Honey is characterized by color, taste, aroma and moisture content. 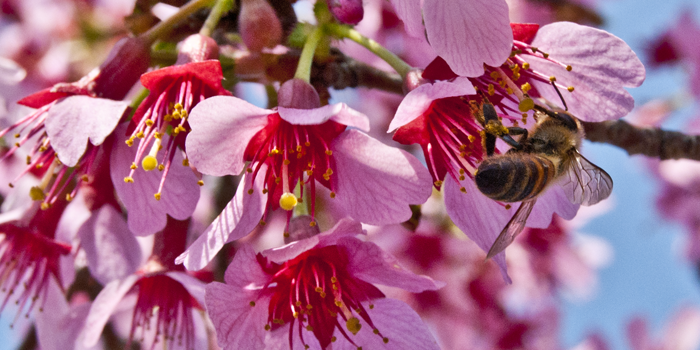 Each batch of honey is as different as the flowers the bees visit. Honey is highly stable against microbial growth because of its low water activity, low moisture content, low pH, and other antimicrobial constituents. Unheated, unfiltered honey is likely to crystalize much sooner than processed honey. Storage of honey in air-tight, moisture-resistant containers at temperatures below 50°F (10°C) are ideal to prevent crystalization. It is also possible to induce controlled crystallization to produce what's known as "creamed" honey (see below). This human processing yields very fine crystals and a smooth product with a peanut butter-like texture. In any case, there is nothing wrong with crystalized honey. In fact, all of my honey will crystalize within a year, and may crystalize much sooner if its temperature is allowed to fluctuate, broadly. Crystalized honey doesn't drip! How can I make crystalized honey liquid again? If you feel that you REALLY must, honey may be once again liquified by warming crystalized honey to temperatures up to 110°F (about the temperature of it's creation) for periods of hours or days. Repeatedly overheating honey should be avoided. Generally speaking, the higher the temperature to which the honey is heated, the faster the crystals will liquify. The balance between temperature and time is complex, so this is a personal choice the user must make. You can liquify small quantities of partly crystalized honey at 85-95°F. Avoid letting the honey get any hotter than about 110 degrees Fahrenheit to avoid "cooking" or sterilizing it. You can liquify a large jar by keeping the honey at that higher temperature long enough to eventually get it back into liquid state but you're better off liquifying small quantities as you need it. That raises the question, Why? Creamed honey is man-made honey product. It spreads like butter at ordinary room temperature, and unlike liquid honey, it doesn't drip. Creamed honey is a intentionally crystallized honey. Well-made creamed honey possesses a creamy texture because the crystallization process has been precisely controlled. Naturally crystallized honey usually results in larger, more "coarse" crystals. Professor Elton J. Dyce, while at Cornell University, learned to control the crystallization process and to produce an extremely fine-grained creamed honey in his lab. Will the bees be ok if we take their honey? What makes honey bees special is their ability to produce honey, and a strong colony with many bees can produce large quantities of honey so that they can survive as a colony through the winter. These workers eat that stored honey and generate enough heat to keep the queen at about 95°F no matter how cold it gets outside the hive. Good beekeeping practices allow beekeepers to manage a hive to produce far more honey than the colony needs to get through the winter and to know how much they can take away while making sure that the bees have enough to do just that. 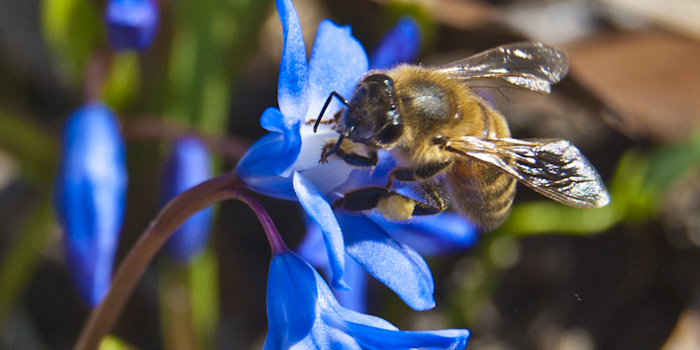 It is in the beekeepers' interest to maintain strong colonies that survive the winter, if for no other reason than that it is costly to replace them in the spring. How much, exactly, IS a pound of honey? A pint's a pound the world around! This refers to the standard definition whereby 16 fluid ounces is equal to 16 ounces (avoirdupoids) by weight, thus, 1 pound of water fills a 1 pint container, both are equal to 16 ounces. Because honey is thicker than free-flowing water -- far more dense -- a pound of honey, by weight, fills only a 10.67 fluid ounce container. To avoid confusion just remember a pound of honey refers to its weight and not it's volume. Is honey scientifically proven to treat a sore throat?
" Drinking tea or warm lemon water mixed with honey is a time-honored way to soothe a sore throat. But honey may be an effective cough suppressant, too. In one study, children age 2 and older with upper respiratory tract infections were given up to 2 teaspoons (10 milliliters) of honey at bedtime. The honey seemed to reduce nighttime coughing and improve sleep. In fact, in the study, honey appeared to be as effective as a common cough suppressant ingredient, dextromethorphan, in typical over-the-counter doses. ...."
This story from the MayoClinic.com. Is honey scientifically proven to treat other infections? There is a growing body of research in this area. Here's one link. 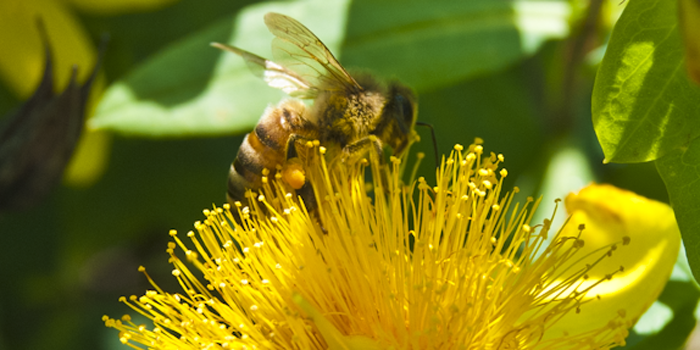 What about eating honey to help with allergies? Many people with seasonal allergies have reported to me real and measurable improvement in their, and their family's symptoms after adding local honey to their diet. Here's some best reading on this topic, yet. Every year I meet more new people who testify to me about the benefits they have, personally, experienced. 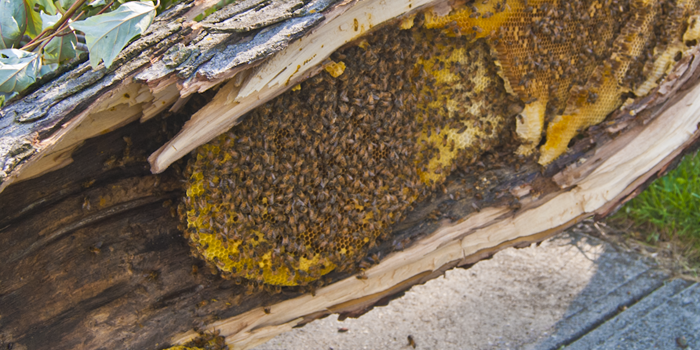 Propolis, sometimes called bee glue, sometimes called Russian penycillan is a thick, sticky resin that bees collect from tree buds and use to cement holes in the hive and defend it against invading parasites and diseases. Where can I visit Carl's bees? You can visit Carl's bees at two locations in Nassau County which are open to the public. One is The Nassau County Cornell Cooperative Extension's East Meadow Farm. 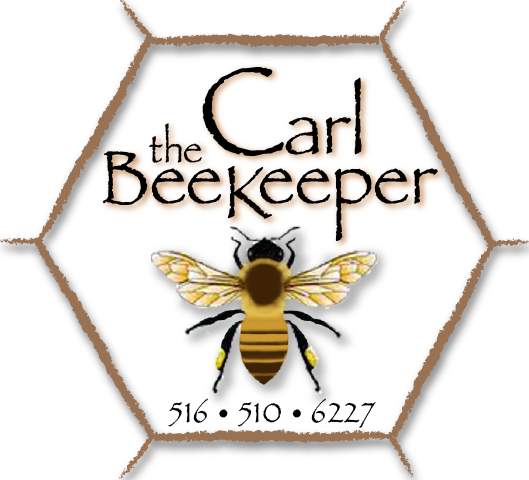 Carl established and maintains several hives on the grounds in East Meadow, NY. The farm is open, free, to the public 365 days a year where you can view the outdoor hives and watch the bees coming and going on days when the temperature is high enough (about above 45 degrees F). You can also visit a unique wall of bees observation hive at the Long Island Children's Museum, on Museum Row in Garden City, NY. Please see the LICM website for fees, hours and other details. Here is a link to some videos on YouTube, that Carl created with Professor Tom Seeley at Cornell. There's a lot of great information in them.